Finals are over and that means summer is pretty much here! With the summer sun comes an urge to get out of your home and visit new (or familiar) places. 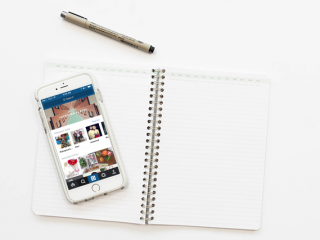 Whether it’s a full-blown international trip or just a last minute weekend getaway, there’s always one inevitable part of going on vacation. I don’t know about you, but the thought of having to plan out and tuck away outfits and items I’ll need days later seems annoying because what if I change my mind when I’m there? What if I need to use something I’ve already packed before I leave? For most women, beauty products are an everyday necessity and that doesn’t change when they head out of town. But fitting every beauty product you own into a tiny travel bag can be a hassle, and forgetting necessary beauty staples can be stressful when you’re in a new place. 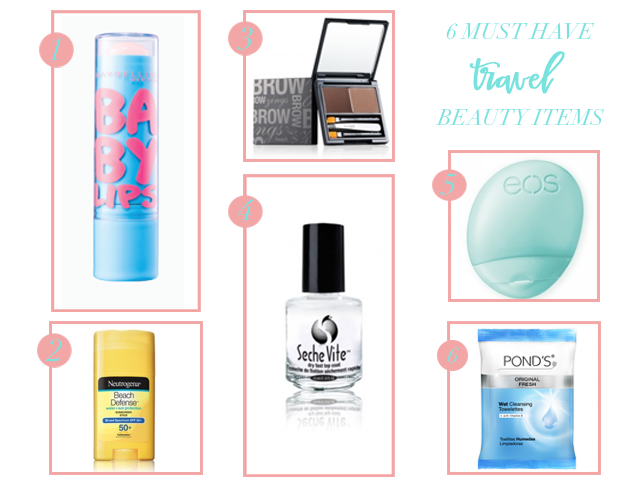 Here’s a list of what I consider to be the top 6 beauty products to travel with and why, so that the next time you go to pack you’re a little more stress-free. This little thing goes with me everywhere no matter if I’m going to the beach or going to class,. Smooth lips not only look better, but are better for you because you’re helping to keep your lips hydrated. Bonus points if it has SPF in it, like one of my favorites Baby Lips by Maybelline. If you haven’t read an article (or seven) by now about how important it is to use sunscreen everyday then stop reading this and do a quick Google search. I’m sure you’ll find all the info you need in the first few hits. Then come back. Bottles can be big and bulky but if you carry around this awesome travel size roll-on one from Neutrogena then you’ll be all good. Just make sure to reapply! Summer is the perfect time to go au natural in the makeup department. However, if you want just a little something to feel put together, nothing is better than a fresh face with brows that really stand out. Filling in your brows makes you looked polished and put together even if you were out until the sun came up. My favorite is a wax and powder duo called Brow Zings from Benefit Cosmetics. I love #manicuremonday but if I’m going on a particularly long trip I don’t want to lug around all my nail stuff. Whether you get them done at the salon or DIY, the best way to preserve your mani is by reapplying a top coat every few days. That way, no matter if you’re gone for the weekend or the week, your nails will still look fresh. 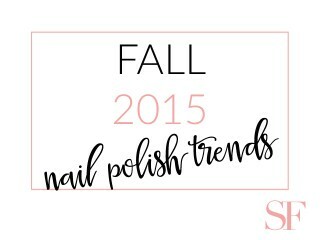 This Seche Vite top coat does an excellent job at preventing chips and keeping your nail polish long-lasting. If you’re taking a plane anywhere you’ll definitely want to keep some lotion on hand. Cabin air can dry out your skin and as soon as you step off the plane you’ll be happy you have some to combat that. Eos makes an adorable one that fits into any carry on. After a day filled with adventure you’ll likely be ready to crash as soon as you return to wherever you’re staying. Keeping your skin clean is such an important part of your routine and there’s no reason to skip it just because you don’t have access to your home bathroom. Keep some cleansing wipes, like these from Ponds, nearby and you can catch some zzz’s that much faster and be ready to start the next day well-rested and fresh faced!